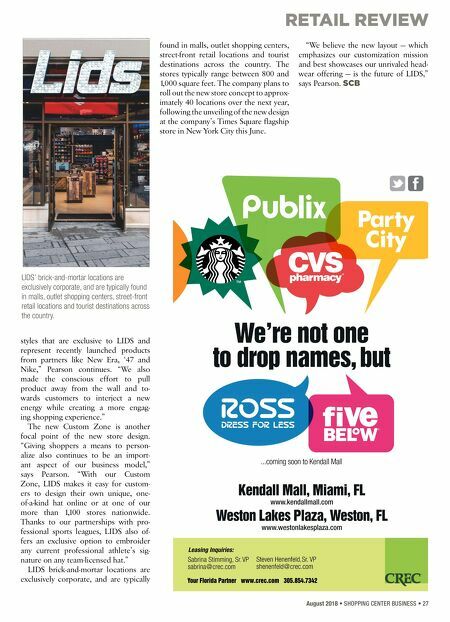 RETAIL REVIEW August 2018 • SHOPPING CENTER BUSINESS • 27 styles that are exclusive to LIDS and represent recently launched products from partners like New Era, '47 and Nike," Pearson continues. "We also made the conscious effort to pull product away from the wall and to- wards customers to interject a new energy while creating a more engag- ing shopping experience." The new Custom Zone is another focal point of the new store design. "Giving shoppers a means to person- alize also continues to be an import- ant aspect of our business model," says Pearson. "With our Custom Zone, LIDS makes it easy for custom- ers to design their own unique, one- of-a-kind hat online or at one of our more than 1,100 stores nationwide. Thanks to our partnerships with pro- fessional sports leagues, LIDS also of- fers an exclusive option to embroider any current professional athlete's sig- nature on any team-licensed hat." 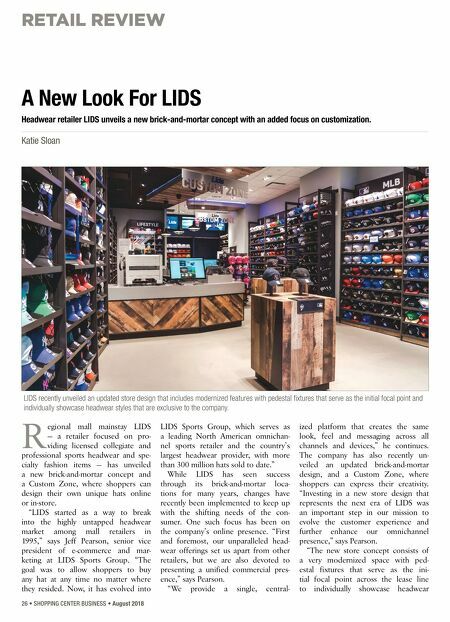 LIDS brick-and-mortar locations are exclusively corporate, and are typically found in malls, outlet shopping centers, street-front retail locations and tourist destinations across the country. The stores typically range between 800 and 1,000 square feet. The company plans to roll out the new store concept to approx- imately 40 locations over the next year, following the unveiling of the new design at the company's Times Square flagship store in New York City this June. "We believe the new layout — which emphasizes our customization mission and best showcases our unrivaled head- wear offering — is the future of LIDS," says Pearson. SCB LIDS' brick-and-mortar locations are exclusively corporate, and are typically found in malls, outlet shopping centers, street-front retail locations and tourist destinations across the country.